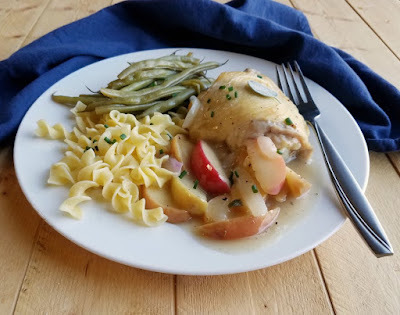 A fabulous dinner loaded with apples, onions and chicken. This savory meal is sure to win over your family and special guests too! This post is sponsored by SwissDiamond as a part of #AppleWeek. As always, all opinions are honest and my own. 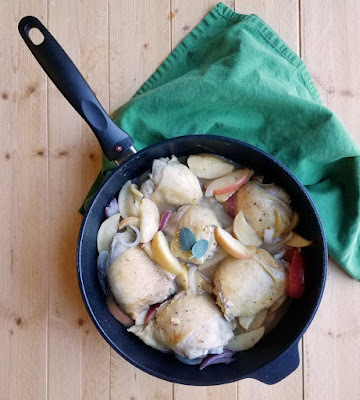 Load your skillet with succulent chicken, flavorful apples and onions too. Balance them all with herbs and make a simple pan sauce to tie it all together. All you need is a little buttered pasta or potatoes and a vegetable for a hearty meal everyone will love. Fall is finally here, the calendar even agrees. So it's time to put fall flavors on the table as well. This dinner is a great way to do just that. It is easy enough to make for a family dinner. I whipped it up after work one night and was quite glad I did. But it is nice enough it could be served to guests as well! I was so excited when SwissDiamond signed on as a sponsor for AppleWeek this year. I already had a few skillets and love them. I'm not the only one either! My husband believes everything should go in the dishwasher. He usually ignores anything I tell him is not allowed in there, as if those items don't exist. I have been coveting the Swiss Diamond - XD Nonstick Sauteuse with Lid 4.8 Qt (12.5") . The problem is I had a similar size pan at home and it worked ok. I knew the SwissDiamond beauty would work great, but my frugal core was torturing me. As soon as the ok pan went to "meh" I was going to upgrade. Then I found out SwissDiamond was sending me the pan I had been drooling over. Actually an even better version with their new upgraded XD interior. I almost fell over myself trying to get to the porch the day it was delivered! No kidding, I made dinner in it 4 out of the first 5 nights I had it. It's been in use at least 3 times a week ever since. I'm not sure why we even bother putting it away! While it is oven safe, I decided to make a stove top dinner in it. 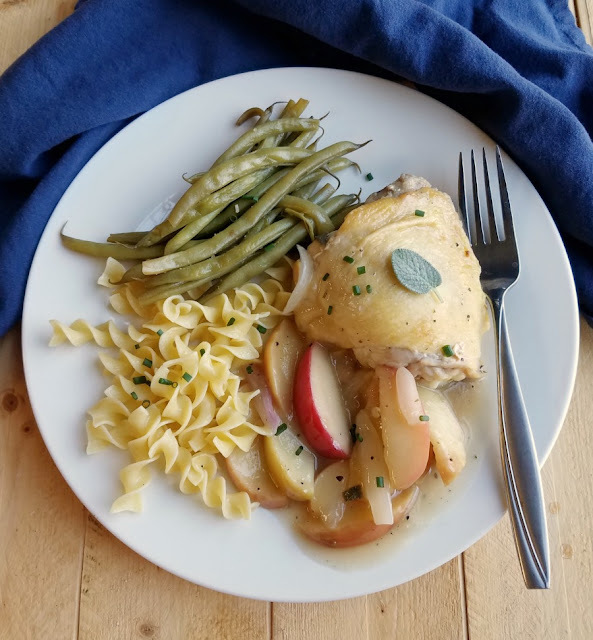 This chicken and apple dinner was an instant hit with my family. Little Dude was happily jabbering on about his fun day in kindergarten when he stopped to tell me how good it was. My husband neglected to tell me about his day so he could get a second helping. Both ringing endorsements, I'd say! Plus it smells amazing while it cooks and is done in right around a half an hour. This week is going to be an amazing week of apple goodies. I am posting a new apple recipe every day and so are a bunch of my friends. There will be over 200 by the time the week is over! Check under the recipe card for today's new recipes. After the week is over every single recipe will be listed on the AppleWeek 2018 page. In a large skillet, warm the oil over medium heat until it ripples. Season the chicken thighs liberally with salt and pepper. Place the chicken thighs in the pan with the hot oil. Cook them about 5 minutes on each side or until almost cooked through. Meanwhile, clean, core and slice the apples and slice the onion. 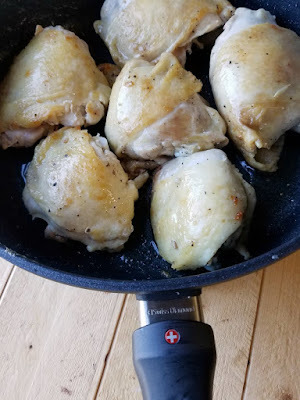 Remove the chicken thighs from the pan. If there is excessive grease, remove all but a Tablespoon or two. Add the onion and apples to the pan and cook for a couple of minutes. Stir together the apple cider or wine, mustard, rosemary, and sage. Pour the liquid into the pan while stirring the deglaze the pan. Be sure to scrape up any bits that might be stuck to the bottom of the pan. Nestle the chicken back into the pan with the apples and onions. Cover and cook for about 7 more minutes. Check the chicken to be sure it is all up to temperature. Stir the cornstarch into 1/4 cup of water and stir into the pan. Allow to come to a bubble and thicken a bit. Adjust the seasoning on the pan sauce to your liking. What a fabulous Fall dinner. I love skillet meals, in fact, I have one for the Blog tomorrow. Apples cook up so nicely in the skillet.Thus sounds scrumptious!! Happy Monday sweet friend! Apples are so good in savory preparations! I love that this is made all in one skillet--it's a must-try for sure! 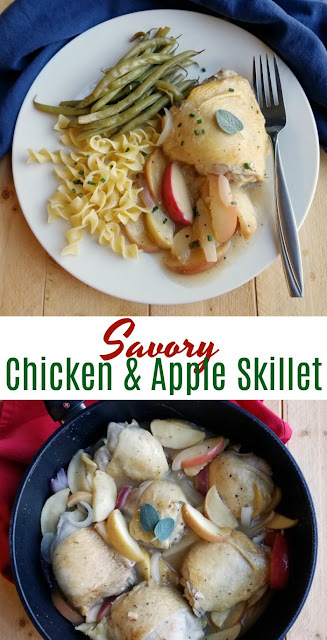 I love apples in savory dishes and this one looks no different! Happy Apple Week! A wonderful looking meal. Wish I was at your house for dinner. Carlee, I am so excited that you got the pan that you wanted. Isn't it wonderful when you get something that you actual want for free!?! 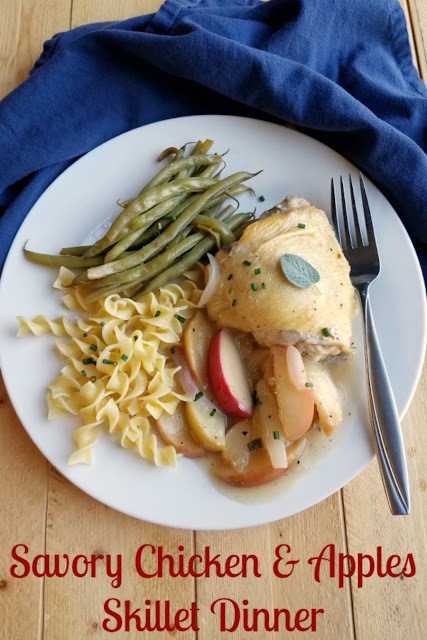 This chicken and apple meal looks fabulous! I hope that Little Dude is enjoying kindergarten. 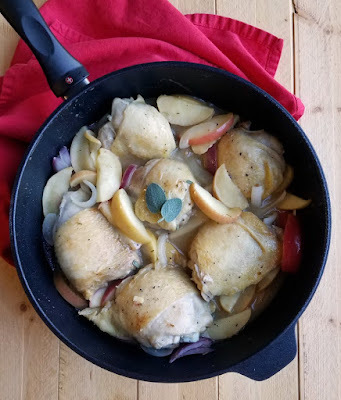 I love apples, chicken and one pan meals so this is the dish for me. Hi Carlee, chicken and apples are not a combination I would ever think to put together. I don't owna skillet, but I'm sure this recipe would cook nicely in the slow cooker too. I am loving the cooler weather! I love apples cooked in almost anything. One of my personal favorite recipes is Crockpot Apple Dumplings with only 3 ingredients, one of which is fresh cut apples. Pinning this collection so I can try some of these! I've never made chicken with apples, but I will be trying this. Great new idea to bring something new to the table! I wonder if I could convince B.O.B. Bob to make this one night for dinner? I think he could handle it!!! I will be trying! Thank you for sharing at our apple celebration of Celebrate 365 Blog Party! This sounds like such a delicious fall dinner. And only one dish to boot! Can't get better than that! I love the chicken and apples combination, this looks delicious! Thanks so much for sharing with us at Full Plate Thursday and have a great week! I must try the one-dish meals! They look so delicious! One of our any day favorites is so simple---apple chunks sauteed in a little butter with a sprinkle of brown sugar, served over ice cream. We love all thing apple especially apple pie and baked apples. We love apple butter. I found the slow cooker apple butter recipe in the #AppleWeek recipes. I'm going to have to make some soon. I absolutely love cooking with apples in the fall. My favorite is definitely Snickerdoodle Apple Cobbler. Me too and now I need to make a snickerdoodle apple cobbler! My very favorite is apple crisp!I never get sick of it! Classics like that never get old!